There is something quite special about being able to stroll around Camden and going from pub to pub and watching bands play and rocking out. For me it creates a satisfying feeling and Camden Rocks combined with the hustle and bustle of a town gives the festival a lively and relentless pace. Tourists in their many numbers, from all the corners of the globe, ventured out to the crunching urban hotspot and the sun could not have been happier to welcome them! Despite the overflowing pavements and every nook and cranny in the area being congested, Camden Rocks carried on regardless. Although I had a plan of who to see, I soon got the impression that catching all the bands I wanted to review was going to prove logistical nightmare. If only teleportation were option then I would successfully navigate my way around. This festival would be perfect for it. Anyway, 200 plus bands performing in across more than 20 venues under the baking London sun was the perfect tonic to a hectic working week! The Witching Season were the first band I took in and I was pleasantly surprised by the addictive crunching drones they were making – they reminded me of early Queens of The Stone Age. Soon afterwards I managed to catch Weekend Recovery’s snarling Courtney Love squeals combined with a tight-knit backing making for engrossing viewing, even if my view was obstructed by many other anticipated punters! I was beginning to clock up the miles when I swung by in time to watch a bit of Bryde’s set. She and her band mesmerised a surprisingly small crowd upstairs at the Blackheart pub. Her powerful and distinctive voice was too big for the venue – it will only be a matter of time before she starts pulling the bigger crowds in at the bigger venues! Now, there’s been a bit of hype and expectation about this next act, The Soap Girls. They played to a packed and captivated audience at the Dingwalls. Their dirty DIY pop-punk melodies brought a bit of charisma and glamour to Camden down by the river. Their costumes did not disappoint! Their angelic looks coupled with abrasive tongues, and with an opinion on just about everything – they lived up to the hype! They weren’t afraid to interact with the crowd and this made for good stage banter! I am sure we’ll be hearing more about these girls in the near future. Following on from this, October Drift were another band who have been receiving the plaudits for their visceral and intoxicating live performances. Their set was one of the highlights from the festival upstairs at The Hawley Arms. If the place had more chandeliers, everyone would have been swinging from them, I certainly would have! Catch them supporting the Editors in their upcoming UK shows. Soon after I wandered into the Camden Assembly (aka the Barfly) and caught Ryan Hamilton & the Traitors, who’s emotive county rock vibes washed over us all and replenished our weary souls from the day’s festival antics. They were a welcome breather from the jam-packed punk/rock/metal schedule. One of the more renowned acts to grace the festival were Blood Red Shoes, and for me they were a personal highlight. Their chemistry on stage was electric at the ballroom! (See what I did there?!) Their experience and command over their instruments was a gluttonous pleasure to the senses! The pace didn’t let up there and before I could catch my breath, I was witnessing stage diving theatrics at Belushi’s. It was lovingly served up on a plate to the punters by Falsheads’ frantic & visceral set. Popped: Thanks for taking the time to talk to Popped Music! So tell us, who are Berries? Berries (Holly): We are a 3-piece rock band who have a love for the 90s US alternative rock scene and we love playing together in a band. It’s our passion and we have a lot of fun doing what we do! Popped: Who are your influences? Berries (Holly): We’re all big fans of the Red Hot Chilli Peppers. They were one of the main reasons why we got together and formed a band. Popped: In the increasingly, over-saturated social media world that we live in today, what do Berries bring to the table? Berries (Lauren): We care a lot about our fans and try to make time for them. Rather than just relying on social media to do all the legwork, although this is important of course, we like to put them first as without them we wouldn’t be playing festivals like Camden Rocks. Popped: Which bands would your dream festival line up consist of? Berries (Holly & Lauren): Good question! Too many to think of but the Red Hot Chilli Peppers would be in there obviously. Nirvana, The Smashing Pumpkins, Pearl Jam and the Foo Fighters, especially the Foo Fighters. We are big fans of theirs! It was great to meet Berries, they gave a good and humble impression of themselves and they’ll definitely be wanting to continue in that fashion. It was too busy to catch a glimpse of their set at the Good Mixer which was a shame! No doubt I’ll be making up for it. 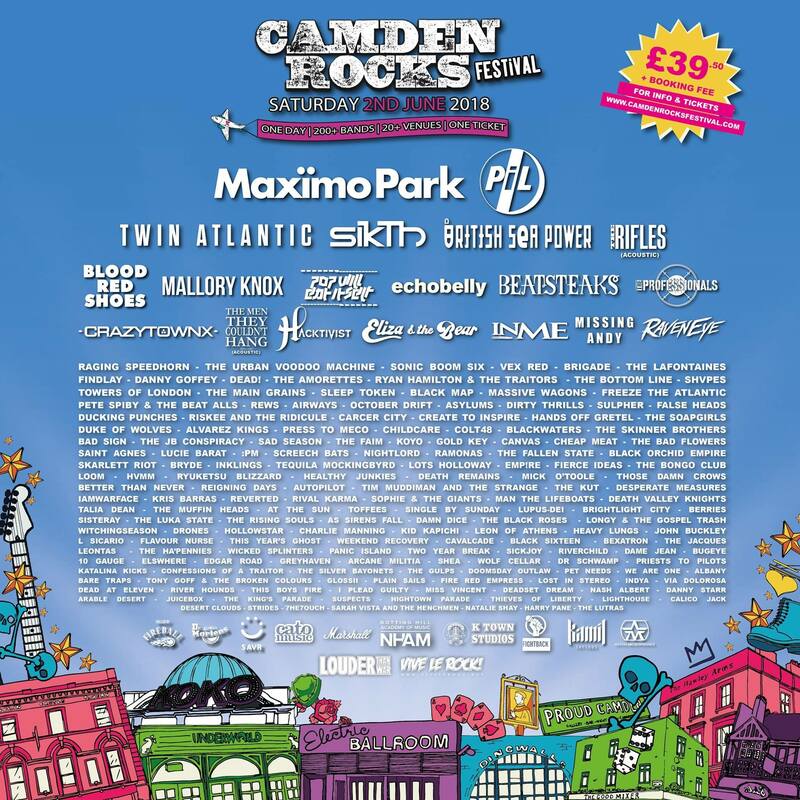 For the remainder of Camden Rocks, the many dedicated hordes of festival goers continued to pummel the streets and pack out the venues in anticipation. For all the big headline acts on offer, I decided to wander over to the dingwalls once more and see one of my all-time favs British Sea Power. I think it is fair to say that over the years, they have become something of an institution for their distinctive brand of environment-conscious indie rock theatrics. They played a crowd-pleasing set and threw in not 1, but 2 big bear mascots who I lovingly embraced during the set! British Sea Power are known for their spontaneous and creative gigs and they certainly didn’t disappoint on this showing and it was great to see them in a small venue. Popped Music’s first Camden Rocks festival has been a nothing short of a triumph amongst the colourful urban circus freak show. The festival added a different and invigorating edge to Camden Town and next year we will be hoping to do it all over again!